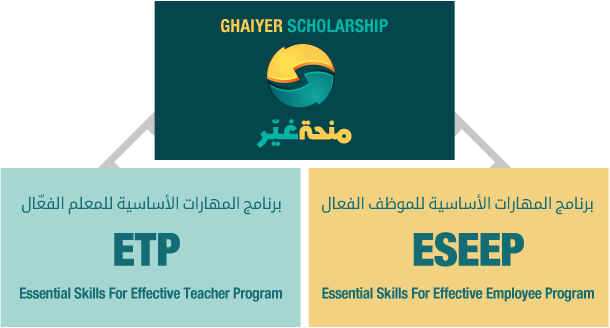 Ghaiyer Scholarship includes different programs, each of which targets a certain segment in order to focus on its requirements and provide it with the necessary training. These programs are subject to review, evaluation and continuous improvement. Ghaiyer Scholarship intends also to add other programs in the future that cover more segments and disciplines in society. The youth represent the hope for any human development our societies are waiting for, or for any other change we expect. The youth in our society are distinguished by their intelligence, ambitions and love for challenge. One of the greatest challenges that our youth are facing is to enter the labor market, and in order to help them to succeed in this challenge, Ghaiyer Scholarship offers an integrated program that fulfills the basic needs of the youth, assists them in developing the necessary skills to enter the labor market with high efficiency and helps them to achieve the desired change. Build up intimacy with others as soon as possible to communicate effectively. Apply the latest technologies required for studying excellence. Recognize the basics needed for time management and apply the latest required technologies. Plan professionally, identify his mission in this life and his small and big goals, and set the methods he will be using to achieve his goals. Express what he is thinking using his voice and body language fluently. Read word by word at a speed not less than 500 w/m with a level of understanding not less than 70%. Write his CV after finding out how to build a team and learning about the administrative divisions in the organizations. Build up intimacy with others as soon as possible, to communicate effectively. Use many tools that generate creative and intellectual trends and lead to creative ideas and proposals. Show delivery skills by using his voice and body language professionally. Manage the classroom in an effective manner. Apply the latest learning theories such as Kolb's model, the Seven Steps and the Adult Learning Theory. Use accelerated learning and its most important techniques in the classroom.